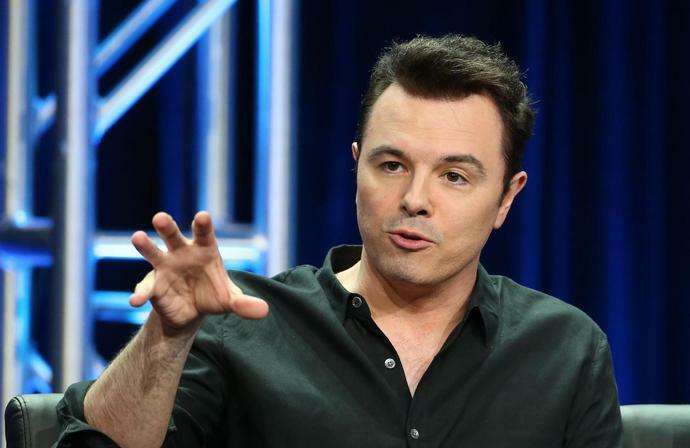 Seth MacFarlane has not exactly been a shrinking violet over the years when it comes to scrutinizing his own home network, Fox. But the creator of Family Guy and The Orville has taken things up a notch this weekend, tweeting that he is "embarrassed" to work for the network after the latest Fox News flap. MacFarlane on Saturday retweeted a post from CNN's Brian Stelter, who commented on what Tucker Carlson told his Fox News viewers. "Isn't this sad?" Stelter asked, before directly quoting Carlson's suggestion that viewers discount other media sources. "If you're looking to understand what's actually happening in this country, always assume the opposite of whatever they're telling you on the big news stations," Carlson said. MacFarlane, in his quote-tweet, went off on Carlson for peddling "fringe sh-t." He wrote, "In other words, don't think critically, don't consult multiple news sources, and in general, don't use your brain. Just blindly obey Fox News. This is fringe sh-t, and it's business like this that makes me embarrassed to work for this company." By Sunday morning, MacFarlane's tweet had racked up more than 27,000 likes and nearly 2,000 comments, many of which suggested that he set up shop at a streaming service. While it is impossible to gauge any actual threat of MacFarlane decamping Fox based on a single tweet, the message comes at a sensitive time after the company lost longtime creative engine Ryan Murphy to Netflix. Fox is also in the throes of sorting out competing bids for its studio assets from Disney and Comcast. Whoever winds up with those prizes, Fox News and the Fox broadcast network will remain together as the cornerstones of the "New Fox" corporate entity, along with the company's leading portfolio of local TV stations. MacFarlane's overall deal is at 20th Century Fox TV, which will be part of the assets moving to Disney or Comcast and will no longer be a corporate sibling Fox News or the broadcast network. He will likely draw interest from other companies when the deal comes up for renewal. As Deadline reported last November, MacFarlane switched agencies, to CAA from WME, in anticipation of the 2019 expiration of his overall deal. Are Democrats dividing on immigration and border security issues? Analysis from Fox News senior political analyst Brit Hume. French officials have ruled out arson and terror-related motives, but conspiracy theorists are spreading misinformation about the Notre Dame fire.